Climbing rose bushes are not only a beautiful plant, they also decorate your home and yard by covering trellises, fences, or porch rails with delicate, fragrant blossoms in a rainbow of color. Climbing roses do not climb as a morning glory or other flower that wraps their tendrils around a trellis. Climbing roses produce canes--some as long as 20 feet--that have to be secured to the porch or fence. Contrary to popular belief, roses are not a difficult flower to grow and once established, climbing rose bushes can grow for many years. Choose a location for your climbing rose bush. It needs full sun or at least 6 hours of sun each day. They require soil with good drainage. Take into account the size of the mature rose bush, as it needs plenty of room to allow for air flow. Inadequate air flow can cause fungus and disease in the rose. Prepare the location for the rose bush. Several weeks before it is planted, dig up the garden site, and remove any weeds, grass or rocks. Mix in a large amount of compost or other organic matter into the soil. Several days before you plant the rose, test the soil; roses thrive with pH levels of 5.8 to 6.8. Add peat moss if your soil is too alkaline and lime if it is too acidic. Plant the climbing rose bush early in the spring, after the danger of frost has past. Before you dig the hole, fill a bucket or large container with water and fertilizer at half strength. Take the rose out of its container and set it int the bucket. Place the hole for the climbing rose about two feet away from the fence or porch, digging it two feet wide and two feet deep. Mix equal amounts of peat moss and potting soil with water in the hole until it has the consistency of soup. Transfer the rose from the bucket to the hole and adjust the height of the rose so that the bud union (the knob between the rose canes and the roots) is right above ground level. Have someone hold the rose in place while you fill in the hole with enough potting soil to firm up the soupy soil mixture. Place the trellis behind the rose if there is nothing else for the rose to climb on; don't push it in too close to the rose to avoid damaging the root system. Spread a layer of mulch on top of the soil surrounding the rose and slightly covering the bud union. Build a dam of much in a large circle around the rose to contain the water close to the bush as it settles in to its new location over the coming weeks. Water the climbing rose bush deeply every other day for a month, directing the water towards the roots and avoiding saturating the leaves and petals. Roses do much better if they are watered in the morning, giving wet leaves all day to dry. Over the first few weeks, gradually remove the mulch from around the bud union. When you see new growth emerging on the rose, reduce the watering to several times a week. Watering the rose deeply forces the roots to go further down and helps the bush survive long periods of drought. 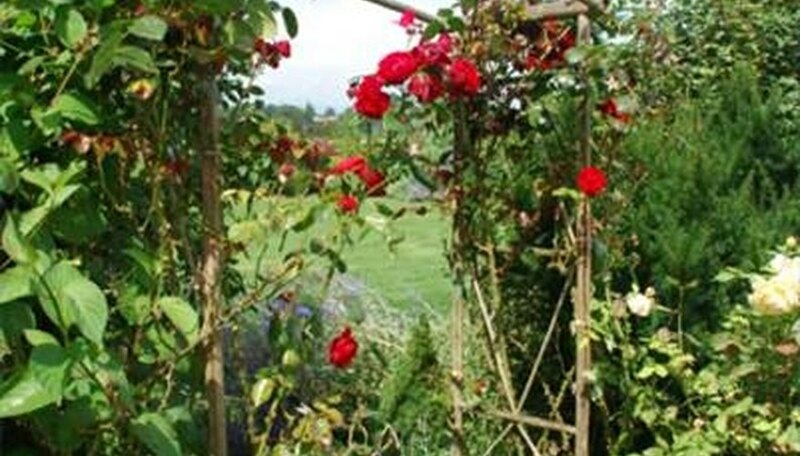 Secure the canes of the climbing rose to its support, using twine or flexible floral wire. Avoid tying them tightly, as it can damage the canes. Prune-or deadhead-the faded blossoms and leaves and clean up any rose droppings around the base of the bush. Throw all leaves and petals away; do not add them to the compost, as it encourages insects and disease. Apply a complete rose food, like Bayer Advanced All-in-One Rose & Flower Care Concentrate once a month. Roses love coffee grounds, used tea leaves and banana peels. Empty the coffee or tea near the base of the rose. Dig a small hole near the rose and stick a banana peel and cover it up. Be careful if your pets have access to these roses; they will dig up the rose to get to the bananas. Wear protective gardening gloves when working with roses.